My farmer friends, Rob and Robby, have a wonderful commercial stone fruit orchard and a couple of handsome old fig trees. In the fig season we often trade produce, and I have the pleasure of coming up with ways to use all of those luscious fruits. This is a super salad, and satisfying enough to be eaten on its own, although it makes an interesting side dish too. Why not make it and find out? Did I mention this salad is also easy to assemble! This will serve two to three hungry adults as a main meal, or give four to six side servings. Recipe is easily adapted to smaller or larger serves. 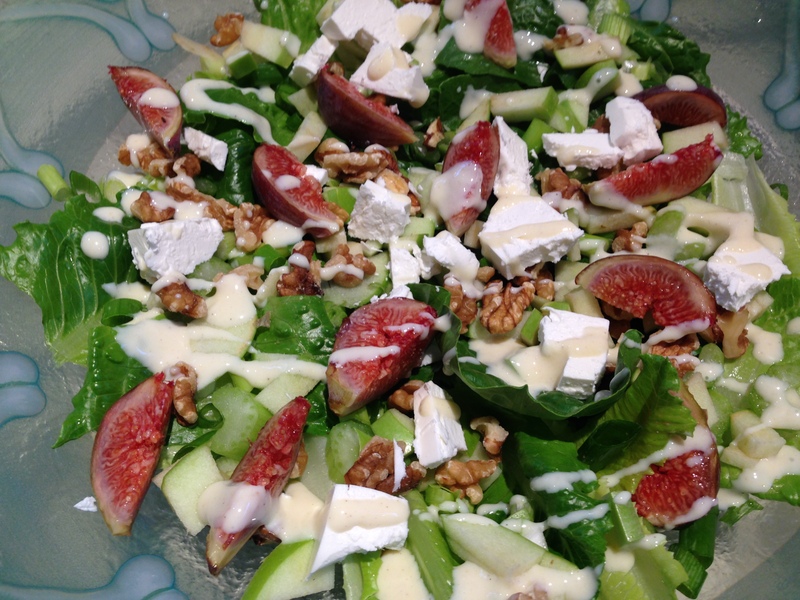 1 cos lettuce, 2 ribs of celery, 2 green shallots (scallions/spring onions), 1 small apple, 4 to 6 ripe figs, 1/2 cup of walnuts, a few thick slices of good feta cheese. Take a wide, flattish salad bowl or platter. Wash and dry your lettuce leaves. Rip the lettuce into bite size chunks putting them straight into the salad bowl. Then slice the celery, apple and shallots into small pieces. Toss with the lettuce. 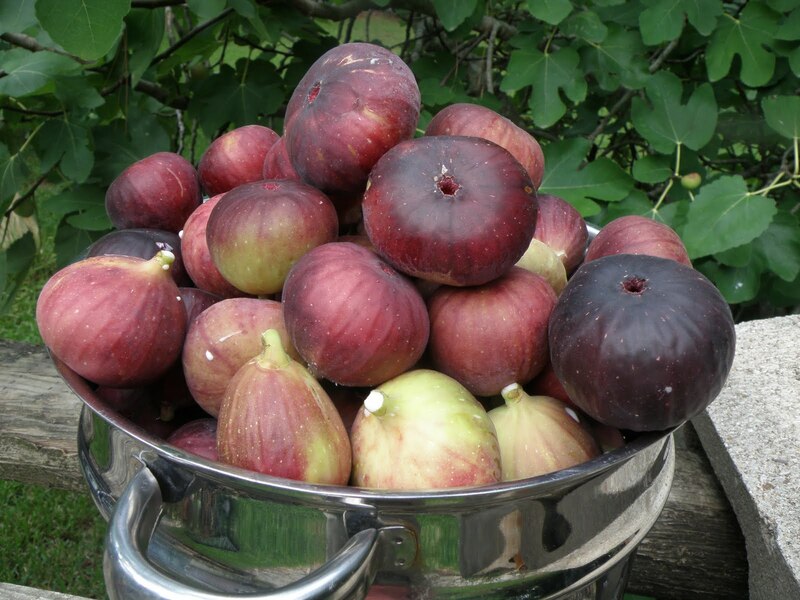 Slice the figs into wedges and place them on top of the greens. Then scatter the walnuts and feta (cut into small cubes) over the figs. Place condensed milk, mustard, a pinch of salt and a grind of pepper into a small bowl. Add the lemon juice and vinegar and stir until well combined. Adjust to your taste. Thin if necessary by adding a little water or milk. Drizzle the dressing over the salad and serve immediately. 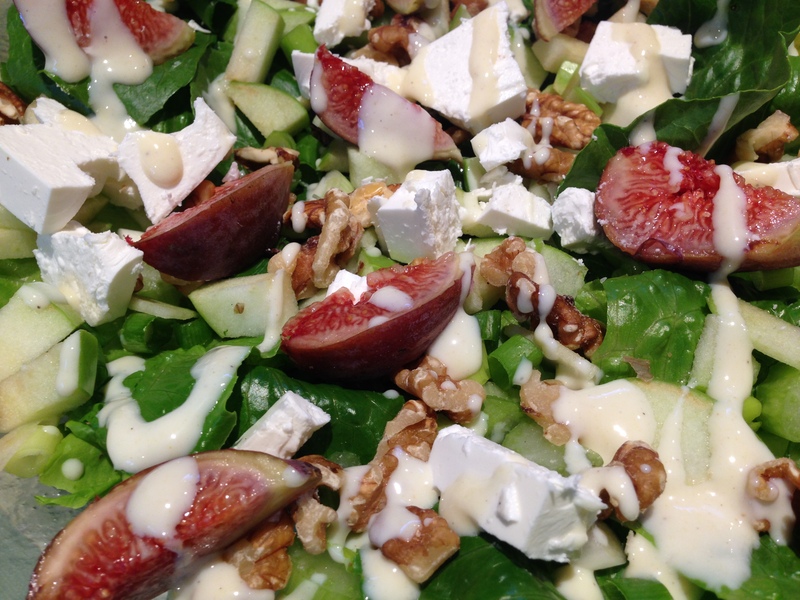 This entry was posted in Salads and tagged dinner party salad recipe, feta cheese recipe, fig salad, fresh fig recipe, fresh fig salad recipe, fresh figs, salad idea, savoury fig recipe by Cauldrons and Cupcakes. Bookmark the permalink. mmmmm….This looks to be a start of a new favorite!!! Thanks Nicole! absolutely fantasic I’m going to use this one for the Easter Dinner starter Thank you Nicole. I just need to wait for a few more figs to ripen. You tease you! 🙂 It will be awhile before I can dive into this luscious salad… No doubt it will be worth waiting for. We like to split the figs and stuff with chevre (goat’s cheese) then drizzle with honey and grill!